Shoes are something I find hard to shop for. Either I spend too little and they fall apart (like tennis shoes for my boys) or I find something I like and then they stop making it when I want a new pair (like my favorite pair of L.L. Bean Mary Janes). I am not a shoe fanatic, rather a practical shoe wearer. I have brown and black dress shoes, tennis shoes, Crocs, and a few sandals I hardly wear. And I feel guilty buying shoes for myself unless they are really worn out, since my kids seem to go through shoes so quickly! However, no matter what your shoe personality, I am sure you might be interested in how to save on shoes, too, (or you wouldn’t be reading this blog). For the first part of my series of posts on shoes, I have provided tips on when to repair your shoes or when to buy new ones. With your shoes off, apply pressure with your thumb to the part of the sole that is under the ball of your foot. If this spot is soft and has more give than the sides, it is time to replace the soles. If you can feel things (like pebbles or debris) through the bottoms of your shoes when you walk, then it is definitely time to replace the soles. You can keep replacing the soles indefinitely. However, if you get a hole that cuts all the way through and the midsole gets wet, it may be time to replace the shoes entirely. Replace when they lose their grip or traction. The soles of sneakers cannot be replaced. Discard running and walking shoes after 300-550 miles of use. For cross trainers replace after about a year. Shoes for court sports should be replaced every month (for those playing 5-6 times per week) or every 3 to 4 months (for those playing 2-3 times per week). Shoes for other aerobic sports can last around 300 hours. Signs to look for: wrinkles in the midsole and uneven wear patterns on the bottom sole. 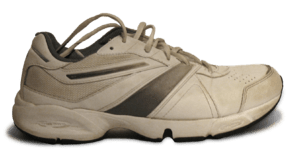 – For specific tips on running shoes, see “When should you replace your shoes” from Fleet Feet Sports. These shoes should last about 5-10 years. The treads can be replaced when you notice heavy wear on the heels and under the balls of the feet. ** NOTE: Keep in mind that deciding whether or not to replace your shoes’ soles will depend on the cost of the shoes. Make sure the cost is worth it! According to my husband, not all shoes can be resoled, too. Check with your local shoe repair. Dirty is okay, that mean you shoes are being used! General wear and tear is what you should be concerned with. Look at your shoes to see if the heels are stretched out, if there are places on the outsoles that worn down or if you can see how the shoes have molded to your foot. You will feel when there is little or no cushioning left in your shoes. Aches or pains in your feet, legs, knees, hips or back after you’ve worn your shoes are a good sign that you need a new pair. Other signs include friction or blisters in unexpected places. This means your shoes have stretched and your feet are moving around too much. More to come on shoe care, shoe makeover tips, and donating used shoes!